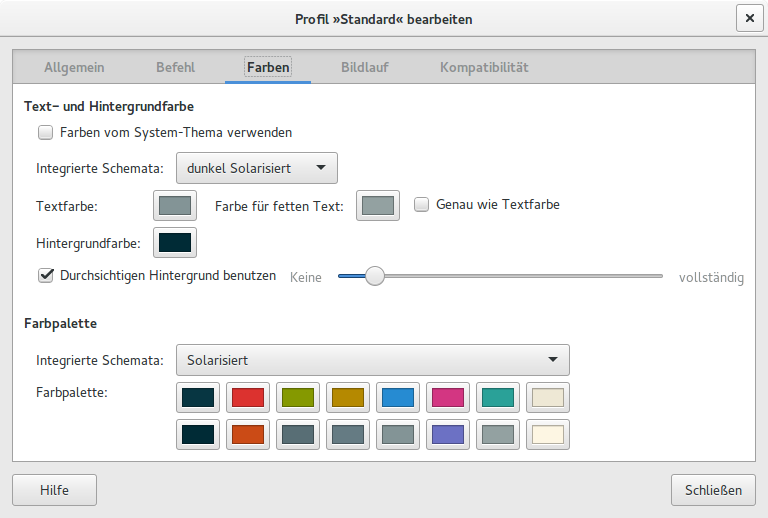 I have just installed solarized color scheme for ubuntu gnome terminal. I have followed this tutorial. eval dircolors ~/.dircolor - this command s causing problems. When I use this command, it changes the color scheme of the terminal for ls. But if I restart the terminal the color scheme goes. What does that command do and how can I keep the preference permanently? This script will ask you which color scheme you want, and which Gnome Terminal profile to overwrite. By default, it runs in the interactive mode, but it also can be run non-interactively, just feed it with the necessary options, see 'install.sh --help' for details. Are you sure you want to overwrite the selected profile? The open the menu EditProfile Settings and Check your settings. It should look something like this (Sorry for the screenshot with German words). Not the answer you're looking for? Browse other questions tagged command-line gnome themes colors or ask your own question. How to change putty color scheme on linux user basis? Nautilus won't use Gnome 3 color scheme? How to apply Vim color scheme to all users?